The Chicago Cubs played their 146th season in the MLB in 2017. They started off by taking on the St. Louis Cardinals on April 2, 2017, and finished the campaign with the best record in the Central Division with a 92-70 record. On September 2, 2017, the Cubs ended the season just how they started it; beating the Cardinals and subsequently winning the division title for the second year in a row. The Cubs then went on to defeat the Washington Nationals in the NLDS. Their playoff run ended when the Cubs lost to the Los Angeles Dodgers in the League Championship Series. The Cubs were the reigning World Series Champions in 2017. With an iconic performance that saw the Cubs end their 108 year drought in the last season, manager Joe Maddon and a roster that has a great deal of offensive, defensive and pitching talent, the Cubs are looking determined for another run into the postseason in 2018. The Cubs are equipped with an arsenal of young talent and are ready to compete in a very contested NL Central. Chicago will look to beat out rivals St. Louis Cardinals and the Milwaukee Brewers for hold of the Central Crown. The Cubs are looking to bring home another World Series trophy after their historic World Series win over Cleveland Indians in 2016. Cubs tickets are always in high demand when they face-off their neighboring Chicago White Sox in the battle to claim Chicago. Get your 2018 Chicago Cubs tickets and head out to Wrigley Field to help lead your team to a championship. The Chicago Cubs have a total of three World Series Championships to their name. Let’s take a look at some of the most memorable moments of the defending world champions’ history. The Third World Series Win - The Chicago Cubs phenomenal win over the Cleveland Indians in the last MLB season certainly tops the list. It will always hold a special place in the franchise’s history because it was the Cubs’ first World Series championship in 108 years. After going down 3-1 in the best-of-seven series against the Indians, the Cubs needed two games in Cleveland and a final at their home (Wrigley Field) to win the title. It seemed difficult but the Cubs pounced back in true Chicagoan fashion, winning both Game 5 and Game 6. In the very exciting Game 7 at the Progressive Field in Cleveland on November 2, 2016, the Cubs finally emerged as the World Series Champions. Winning the Pennant Over Los Angeles Dodgers - In Game 3 of the National League Championship Series, Dodger’s left-handed starting pitcher Rich Hill shut out the Chicago Cubs at the Dodgers Stadium, giving his side a 2-1 series lead. Now two more games were left in the Dodgers Stadium before the teams clashed for the final one in Chicago. Things did not seem to go in the right direction for the Cubs who were to face pitcher Clayton Kershaw in Game six. But in the last three games of the series, the Cubs let their bats do the talking and scored 23 runs. They finished with a double-play in the ninth inning at Wrigley Field on October 22, 2016, and earned their first National League Pennant since 1945. The Chicago Cubs share rivalries with a number of MLB teams. And with the way they are performing, their opponents have every reason to worry. Mentioned below are a few of Cubs’ prominent rivals. St Louis Cardinals - The rivalry between the St Louis Cardinals and the Chicago Cubs is also called The Downstate Illinois rivalry and the Route 66 rivalry. It is amongst the most intense rivalries in the MLB and in North American professional sports. While the Cubs have the lead in the regular season series, the Cardinals rank third in National League Pennants. However, the Cardinals still have an edge in World Series success with 11 Championships to their credit. When the NL split into first two and then three divisions, the two sides remained together, giving rise to several Pennant races. Chicago White Sox- From The Windy City Showdown to the North-South Showdown and from the Cross-town Showdown to the Chicago Showdown, several names have been coined to describe the rivalry between the Chicago White Sox and the Chicago Cubs. In the two teams’ history, the 1906 World Series certainly stands out. Back then the White Sox were labeled The Hitless Wonders while the Cubs were the clear Championship favorites. The White Sox managed to take the series in Game six and earned the World Series Championship title, putting all negative notions to rest and proving themselves as Chicago’s top team. This historic Game six was held at the South Side Park on October 14, 1906. Southsiders and Northsiders are well aware as to what it means to wear the black and white or the cubbie blue in the city of Chicago. Every time the two teams clash in the annual interleague games, the city is all fired up. The Chicago Cubs franchise has been around since 1876. Over these years, several players have stepped onto the field in the Cubs’ uniform. Below are a few whose contributions to the franchise cannot be overlooked. Ernie Banks - He is not just the greatest Chicago Cubs player of all-time but also one of the best players baseball has ever seen. He played his entire 19-year MLB career with the Cubs, posting 512 career home runs (1953-1971). Banks was honored with the MVP Award both in 1958 and 1959. He was consistent in the team’s lineup throughout his career and hit 40 or more home runs in each season from 1958 to 1960. As a tribute to his career and in recognition of his contributions, a statue of Ernie Banks (in his familiar batting stance) has been placed at the entrance of the Wrigley Field. Ryne Sandberg - Having played a phenomenal 15 seasons with the team, Ryne Sandberg is one of the greatest Chicago Cubs players of all-time. He is best remembered for his two game-tying home runs against closer Bruce Sutter of the St Louis Cardinals, at the Wrigley Field on June 23, 1984. Sandberg retired as the highest paid baseball player in 1994 but returned two years later to play his two final seasons. He is regarded as the best second baseman in the history of the game. His MLB career boasts a batting average of .285 and a record of 277 home runs (as second baseman) which was later surpassed by Jeff Kent in 2004. Loyal Cubs fans anxiously await the Chicago Cubs schedule to be released so they can plan their next trip to visit one of America's oldest ballparks. No matter how the Cubs are doing on the bases, Wrigley Field is always a great place to watch a ball game. Enjoy the historic ivy-covered brick wall and enjoy one of the leagues last hand-turned scoreboard. Make sure to not forget to visit the iconic marquee outside of the stadium. Outside the stadium, fans go out in Wrigleyville to enjoy a unique Chicago baseball experience. Take a look at the Cubs game schedule and check out the dates and tickets price range for all the home and away games. Quickly make your bookings for what are expected to be super exciting baseball face offs. Our process for purchasing cheap Chicago Cubs tickets is simple and fast. There are so many online ticketing sites, that it can be hard for customers to find the right place to buy Chicago Cubs tickets at the cheapest price. At ScoreBig we think of our customers first and foremost. We offer daily deals for Chicago Cubs events, so our customers can get the best seats for the best prices. ScoreBig will always go above and beyond to offer the cheapest Chicago Cubs tickets on the market. The Chicago Cubs schedule above, displays all available events for 2019 and 2020. Once you find the event that you would like to go to, click the red “Get Tickets” button. It is located on the right-hand side of the event listing, it will take you to an Chicago Cubs event ticket page. ScoreBig's event ticket page will display all available Chicago Cubs tickets for that event. On the event ticket page to help with your search for the right Chicago Cubs tickets, use the filters at the top to select quantity, price range, and more. There is also an interactive seating chart so you can pick where you want to sit. When you are ready to buy a ticket, click on the listing, and you will be directed to ScoreBig's checkout page. Upon completion of the information fields, your order will be processed and your Chicago Cubs tickets will be delivered via email, mail, or to your mobile device. What makes ScoreBig’s site stand out from the rest? We are constantly analyzing our competitors to improve our site, service, and prices. ScoreBig.com employees strive to offer the best process and experience to buy cheap Chicago Cubs tickets. Our goal is to get you the best seats to Chicago Cubs events. We offer daily discounts on our site and for special promotions check out our newsletter. If there are no Chicago Cubs events currently available, you can use our search feature at the top of the page to see a list of all popular events going on near you. No matter your price point, we have all the best deals and discounts on Chicago Cubs tickets. For more information on prices of Chicago Cubs tickets and the schedule for Chicago Cubs, check out our listings above. The last thing you want to find out is when the Chicago Cubs event you wanted to go to is sold-out. Don’t worry in many cases ScoreBig has affordable tickets to sold out events. We sell tickets from GA all the way to premium seating and parking. Skip the scalpers in the parking lot and get your tickets online from top Chicago Cubs ticket brokers. We get you in all events, buy your Chicago Cubs tickets here from a brand that many trust and rely on for all their ticketing needs. ScoreBig offers a 100% money-back guarantee. If you have been in search of cheap tickets for Chicago Cubs, ScoreBig by far is the best option. That’s why ScoreBig has more loyal customers than any other ticketing site. 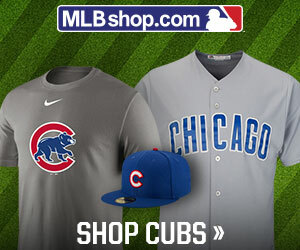 Shop at ScoreBig for safe and secure Chicago Cubs event tickets.